With its natural complex Green Lift, Lavera Vegan Firming Night Care improves skin tone while providing the dose of hydration it needs. It naturally boosts cutaneous collagen and slows cellular aging. Rich in natural active ingredients like karanja vegetable oil, it brings suppleness and firmness to your skin. The hyaluronic acid present in this vegan care fills wrinkles and promotes cell regeneration. Plumping effect guaranteed ! Thanks to its light texture, it penetrates quickly for a feeling of immediate comfort. 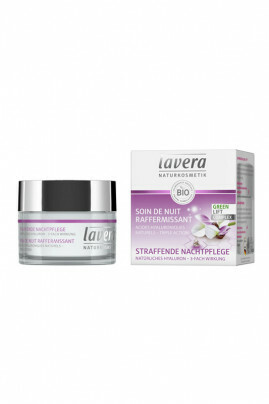 Perfect for demanding skin, this Lavera Vegan Firming Night Care is a must for smooth, firm skin ! In the evening, after gently cleansing your skin, apply Lavera Vegan Firming Night Care with light circular motions. To enhance the action of this night cream, we advise you to associate it with Lavera Vegan Firming Day Care for a 100% natural routine! Vegan Lavera Firming Night Cream is full of natural active ingredients !